As I mentioned in my previous post, just a couple of days after finishing my Brewmaster exams, family business took me to British Columbia for a couple of weeks. In retrospect, the timing was not perfect–I flew out of Toronto just a few days before the Ontario Brewing Awards, and left B.C. just a few days before the Canadian Brewing Awards in Victoria. 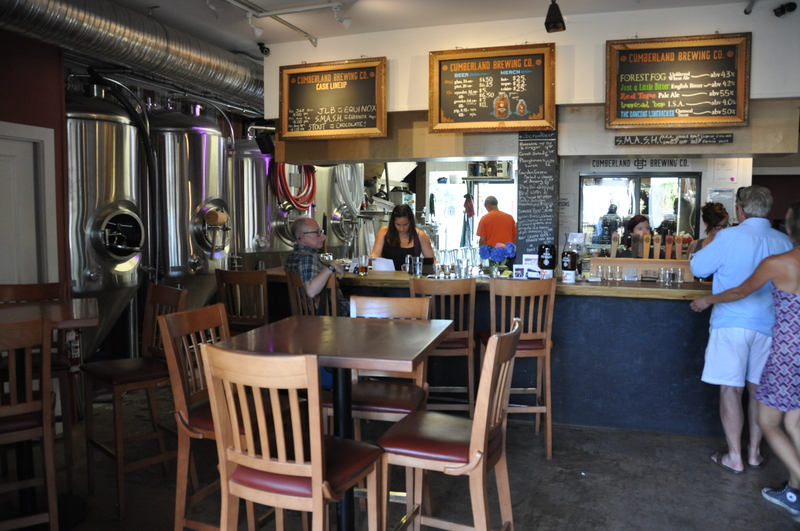 However, on the plus side, once my family commitments were completed, I had some time to explore some of the craft breweries on the West Coast. 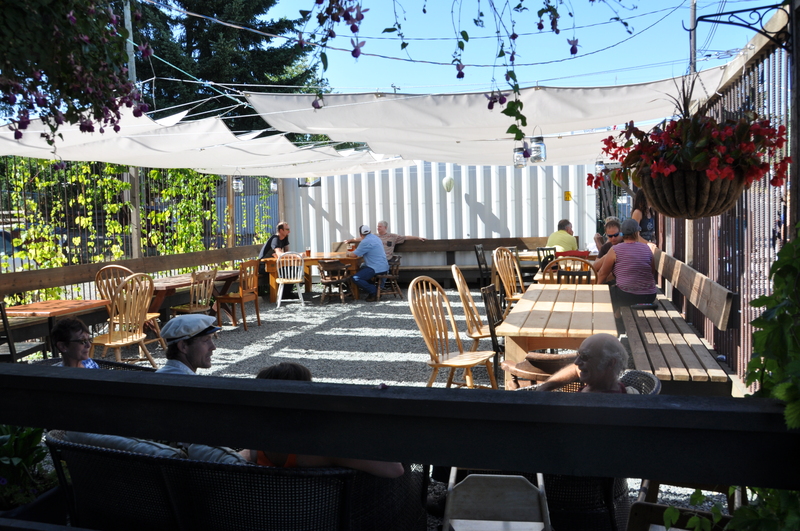 Nurtured in the Northwest craft beer movement of the 1980s, B.C. craft brewers have always been about five years ahead of Ontario in terms of consumer attitude and marketplace penetration. So if you think the craft beer scene is burgeoning in Ontario, you need to visit B.C., where the craft beer scene is exploding. This year alone, nine new breweries and brewpubs are scheduled to open in Metropolitan Vancouver, bringing the city’s total to 20. And new breweries are popping up around the province as well. 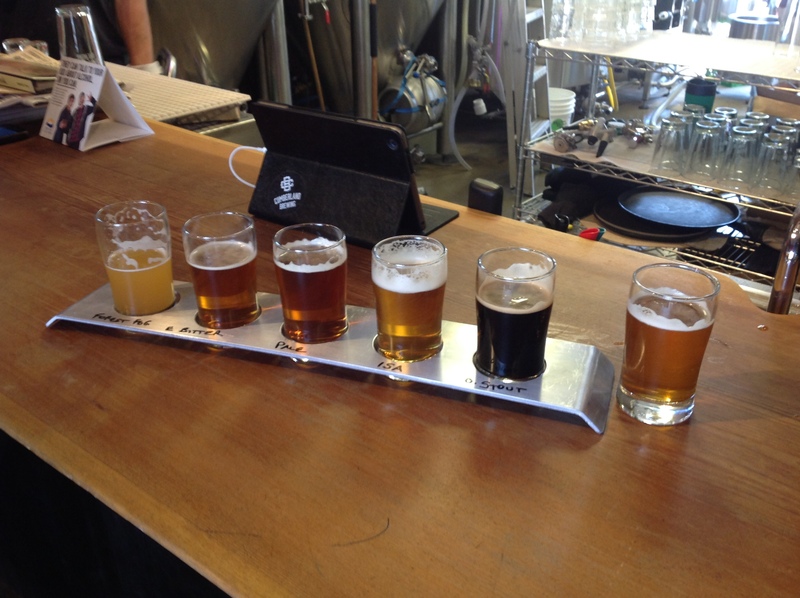 I decided to start my journey of exploration by driving out to Tofino Brewing on the west coast of Vancouver Island. 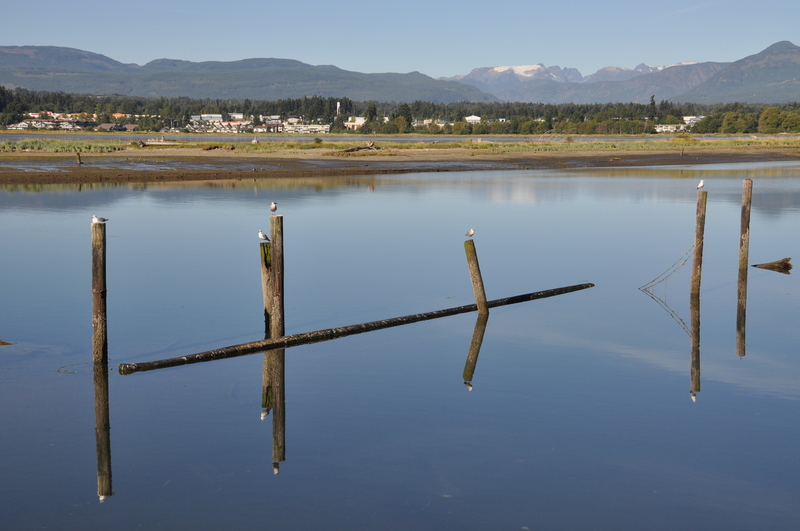 Tofino is one of a handful of small villages that cling to the harsh mountainous western coast of Vancouver Island. 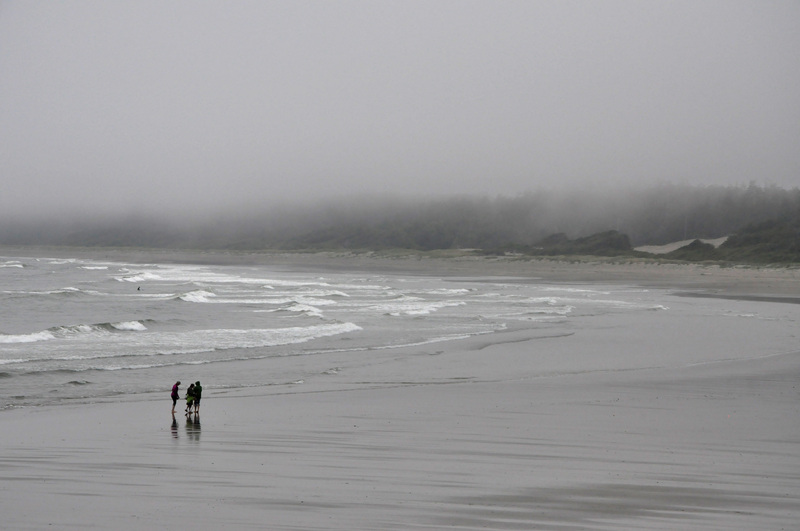 With nothing between it and Japan except several thousand kilometres of Pacific Ocean, Tofino is lashed by fierce storms in the winter; even summer days are usually accompanied by a daily blanket of morning mist, rain and cool winds. Fifty or sixty years ago, there was only a tiny fishing village here, connected to the populated east coast of the Island by a bone-shaking, white-knuckled, 6-hour drive over a tortuous gravel road clinging to sheer cliff faces. Then in the 1960s, hippie surfers discovered the big ocean waves endlessly rolling onto Long Beach, a 20-km stretch of hard tidal sand just outside Tofino. The Clayquot Sound old-growth forest controversy of the 1980s, pitting loggers against the nascent eco-movement, brought attention–and even more visitors–to this part of the world. The gravel road was paved and improved, cutting the 6-hour drive to about 90 minutes. Now Tofino is a busy tourist town offering eco-adventures via kayaks, floatplanes, and whale-watching boats. A new generation of surfers has arrived, and like their snowboarding ilk at Whistler and Banff, they eke out a living waiting tables and doing odd-jobs between surfing sessions. The big door is open: C’mon in! 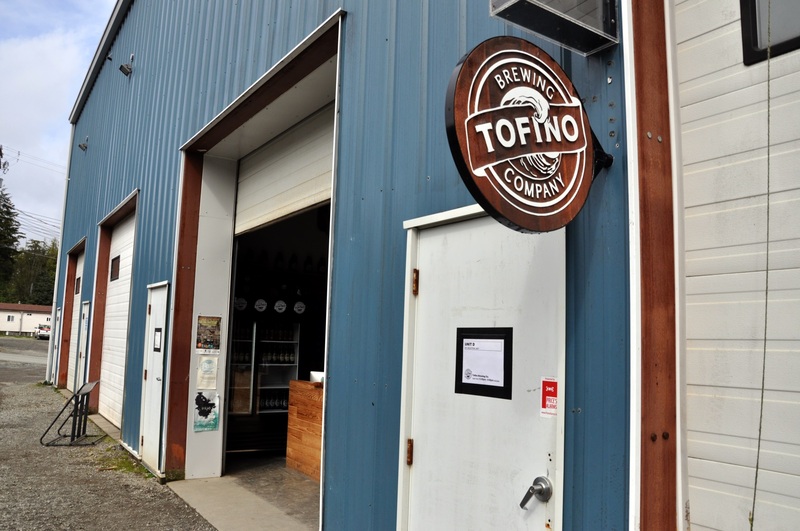 Tofino Brewery is located in a section of an industrial building just outside of town. 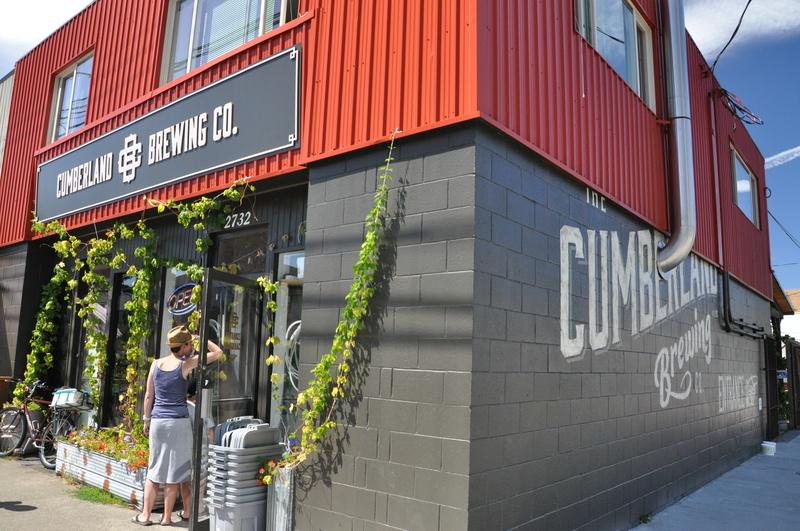 Like several other small breweries we visited in B.C., if the big delivery door was shut, the brewery was closed. If it was open, come on in! 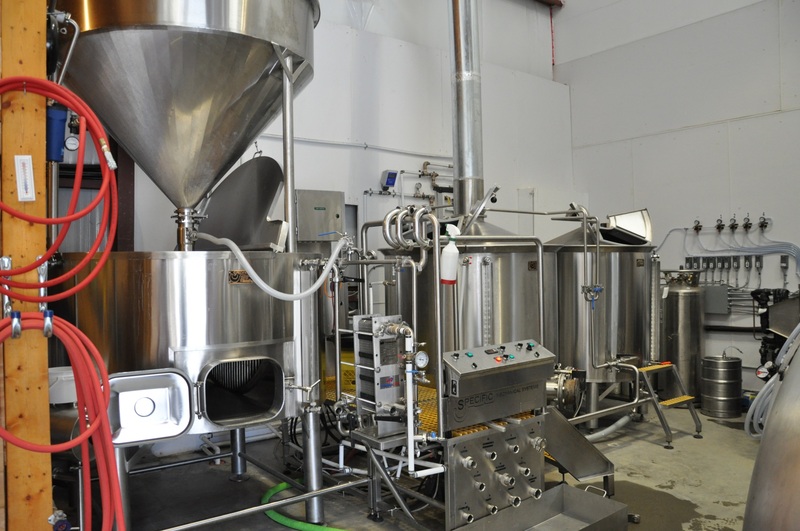 As luck would have it, the brewery was open, and when I introduced myself, I was given a quick tour–not quick in the sense that they were eager to get rid of me, but quick because it is a pretty compact set-up. I confess that, given the young average age of the locals, and the laid-back lifestyle of a population more interested in rippin’ the primo rollers around nearby Incendiary Rock than in getting a science degree, I half-expected to see the brewing dudes at Tofino Brewing standing around a 50-litre pot, stirring the mash with a piece of driftwood. The mill tower (and motorcycle stand). Bags of grain are carried upstairs and poured into the two-roller mill. 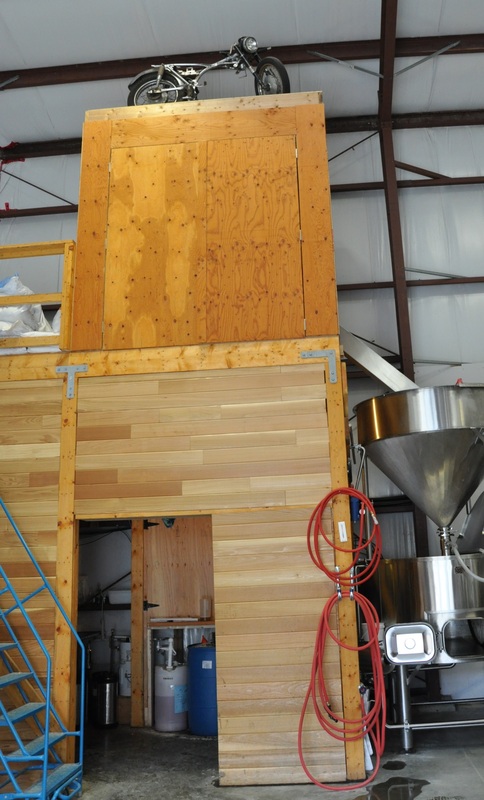 Milled grain slides into large funnel where it is pre-hydrated as it falls into mash tun. 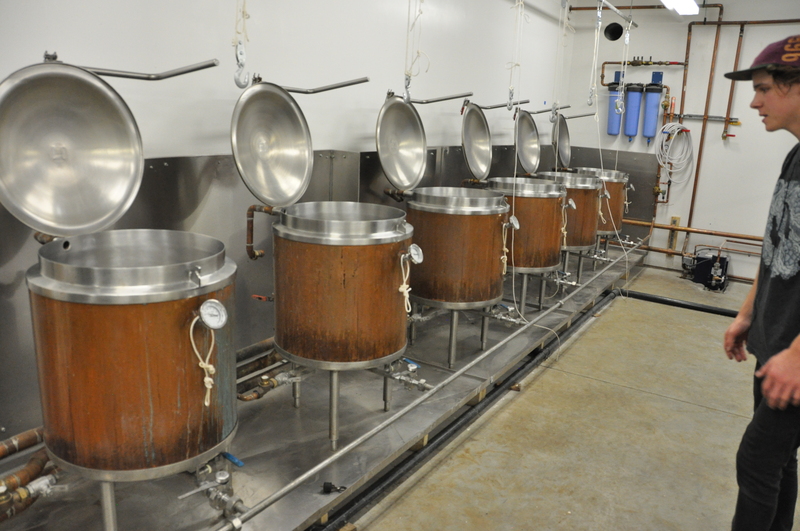 However, what I saw instead was a clean, professional state-of-the-art brewhouse. The single room contains the sampling bar/retail operation, the grain tower holding a two-roller mill (whimsically topped by an ancient motorbike frame), the brewhouse, and fermenters. 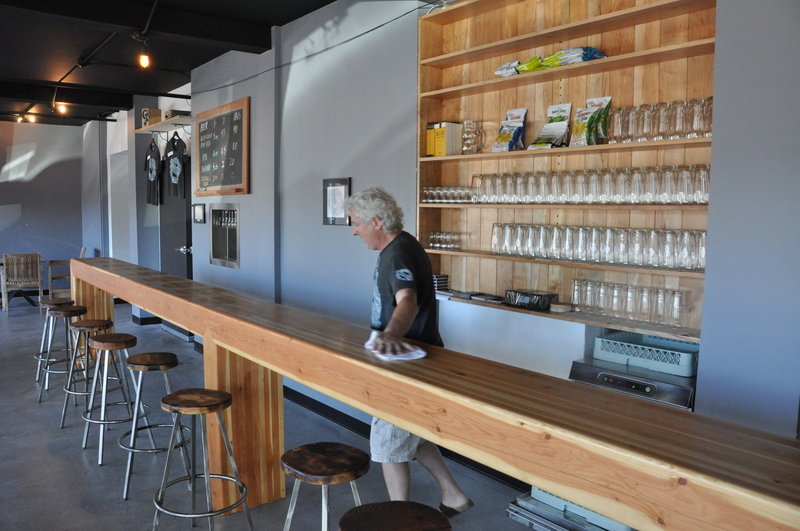 The brewery was founded a couple of years ago by three friends who were tired of financing their surfing habit with arduous odd jobs around town. 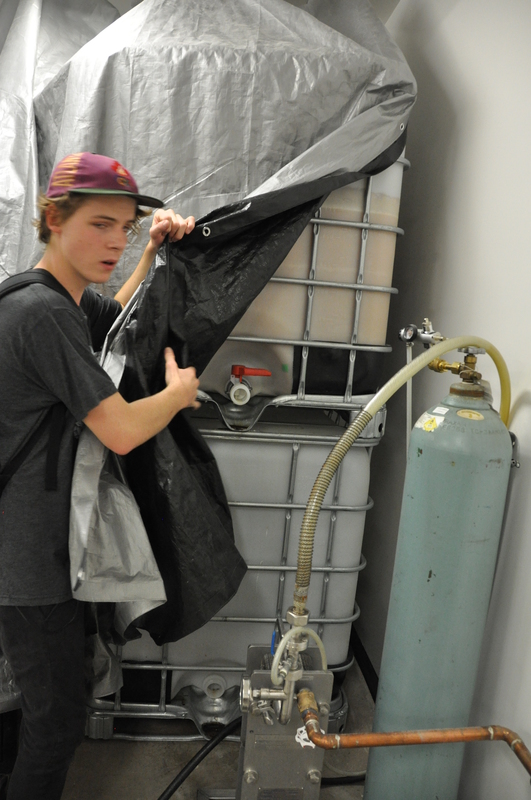 Having between them various business degrees (but no brewing experience), they put together a business plan for a local brewery, and convinced brewmaster David Woodward of Whistler Brew House to move to Tofino. The brewhouse has a mash/lauter tun of perhaps 10 hectolitres (due to my lack of notes, I’m guessing at capacity based on my photos), and I seem to remember my guide mentioning that they could push capacity to a typical knock-out of 13 hectolitres of wort. Fermenter farm. Smallest FV at far end was one of originals. Largest on the right is the newest. From the whirlpool, the wort flows through the heat exchanger to one of eight fermenters. 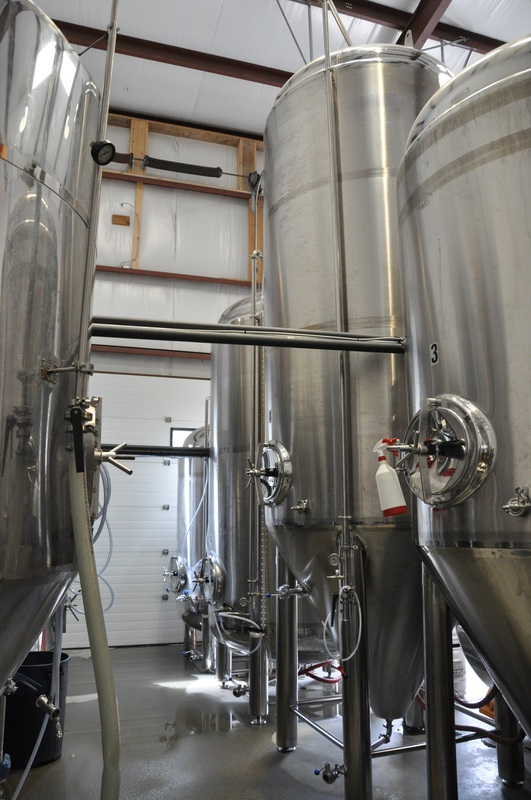 The brewery started with three FVs–one horizontal and two cylindrical-conicals–each capable of handling a single batch. They have since invested in several double batch cylindrical conicals, as well as one capable of handling a triple batch (or perhaps it was a quad batch). 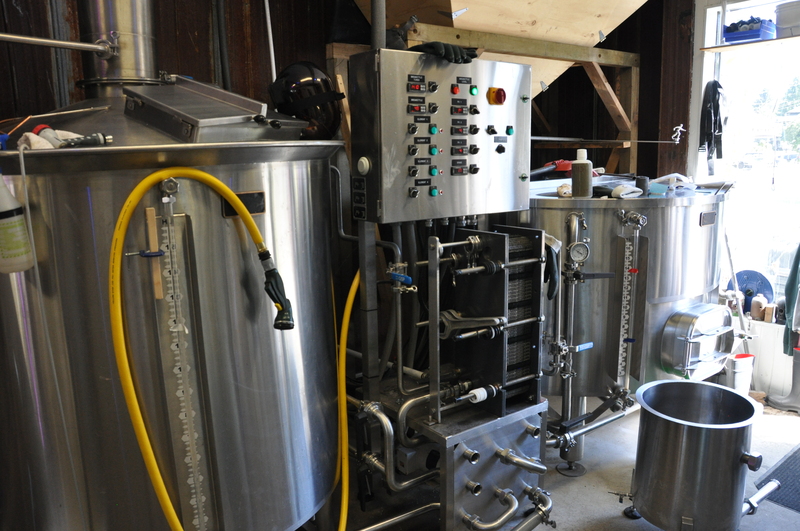 The horizontal fermenter has been converted into their hot liquor tank. 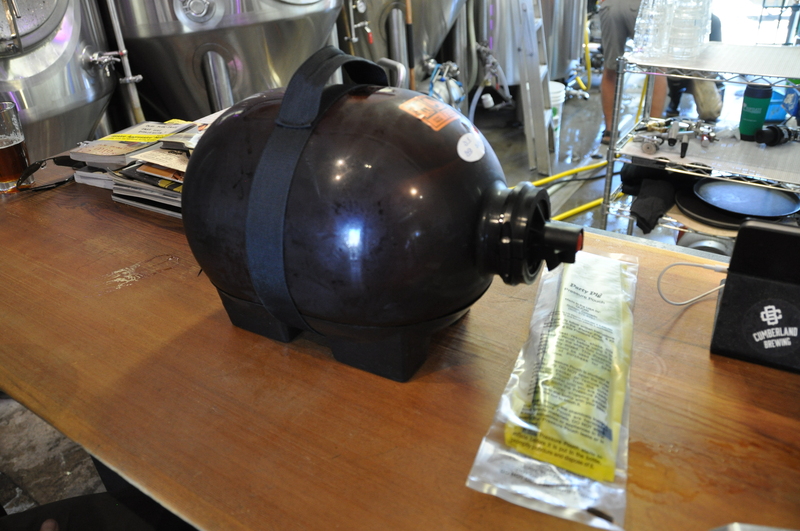 The brewery initially didn’t have enough room (or the money) for a bottling line, so the original business plan envisioned direct sales at the brewery via refillable growlers–consumers would buy a growler, then bring it back to the brewery to be refilled. 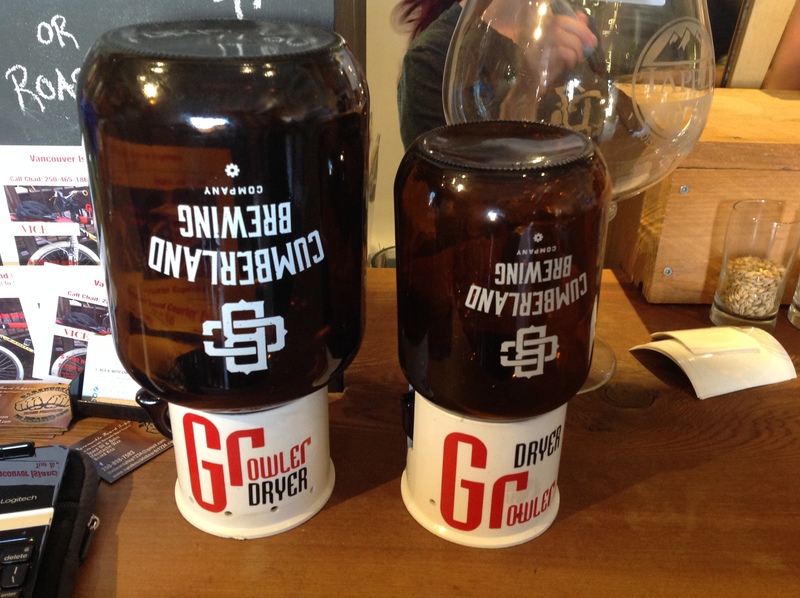 Apparently the recycling aspect of that plan struck a strong resonant chord in this eco-friendly community: the brewery originally bought 300 growlers, thinking that would last them a month–those sold out in less than a week. They ordered another 600–those were gone in another week. 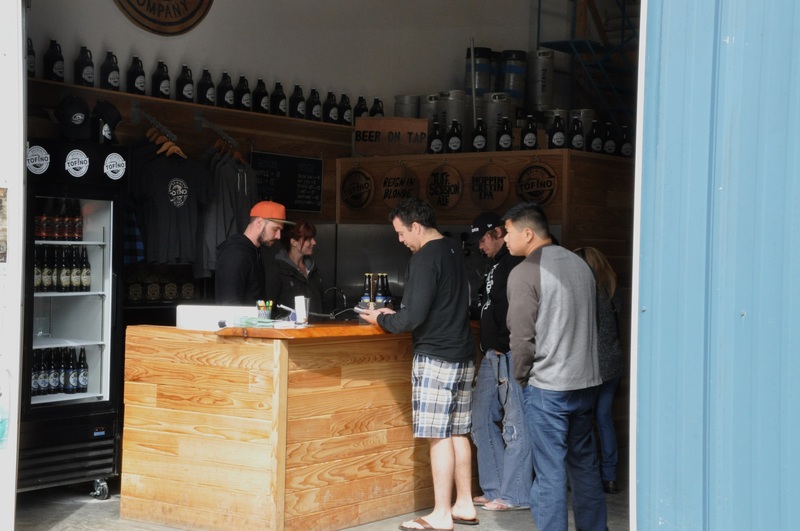 Local demand for Tofino beer was–and continues to be–overwhelming. In the 30 minutes I was there on a Saturday mid-afternoon, an endless stream of casually-dressed locals arrived to have a growler (or two) filled. Demand being strong, when another unit of their industrial building became available, the brewery quickly moved in, turning part of the space into a cooler capable of holding dozens of kegs for delivery to local restaurants. The remainder of the new space gave them the room they needed for a 6-head Meheen bottle filler. Although this is probably capable of filling more than thirty 650-mL bottles a minute, the small table-top bottle labeller really slows the process down, since each bottle has to be individually hand-inserted and removed. The open-air lounge. Casual dress encouraged. The tour finished, samples were quickly offered at the in-house bar, and gratefully accepted by this thirsty traveller. (Hence the lost notes.) Tofino’s flagship beers are a fairly mainstream blonde, a nice English-style pale ale (with the aforementioned caramel notes), and a snappy northwest-style IPA–de rigeur for this part of the world. 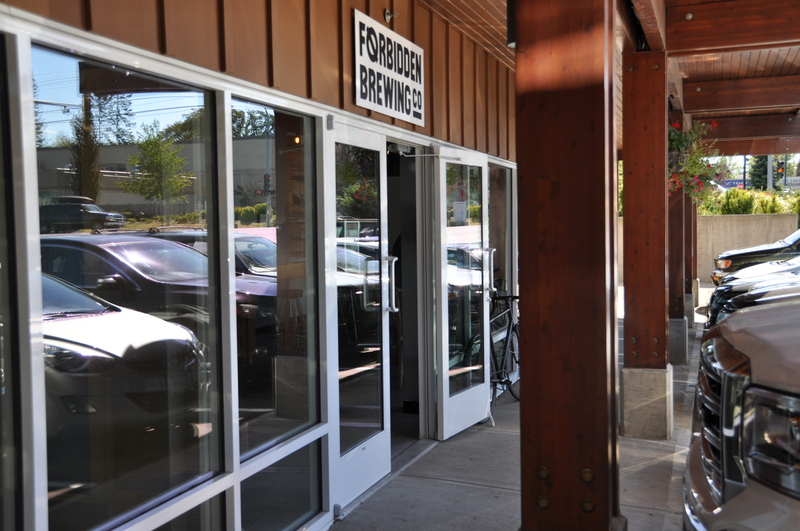 They also had a coffee porter bottled–another clever addition to the lineup, since good strong coffee is a huge part of the West Coast lifestyle–but alas, none was on tap. Curiously, you can’t buy a single 650 mL bottle at the brewery–the minimum purchase is four bottles, which is more than my poor suitcase would hold for the flight home (unless I discarded all my clothes, a concept with which I briefly toyed). 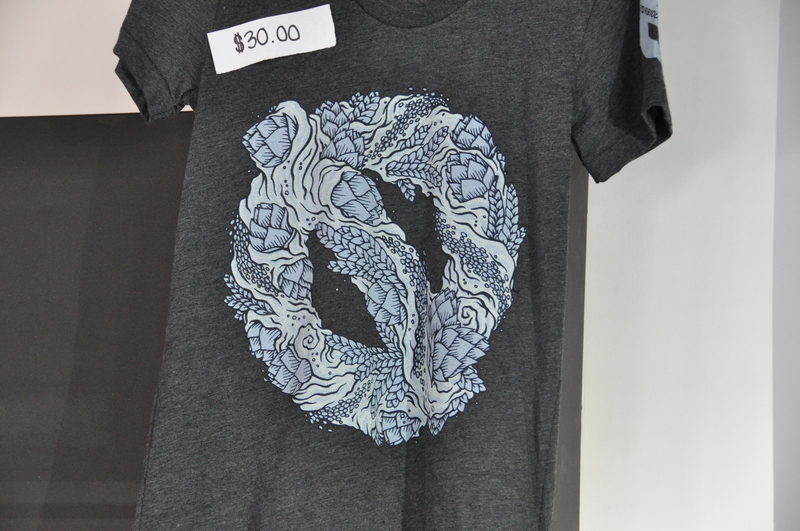 In any case, I left without a bottle of the coffee porter, but I did buy a logo t-shirt, since I do not have enough t-shirts with brewery logos. The last phrase of the previous sentence is a complete lie. 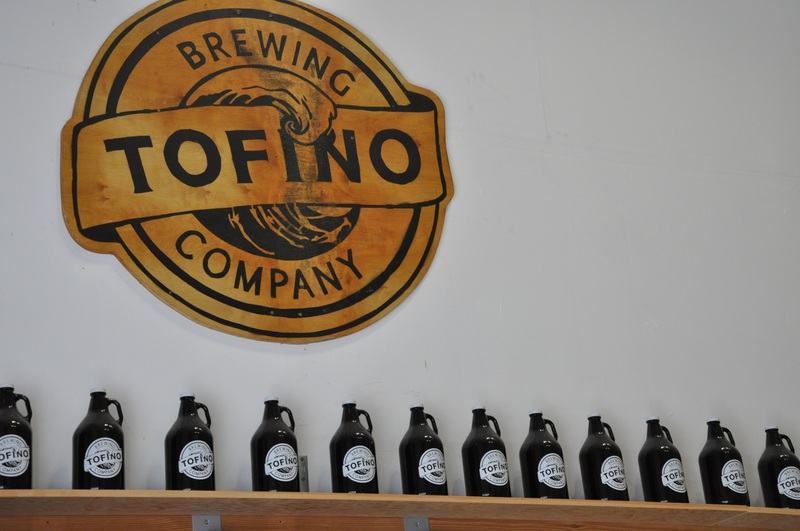 In a nutshell, despite the added expense of having ingredients shipped from mainland to the Island, and then shipped to the far side of the Island, Tofino Brewery seems to be a rollicking success, buoyed by the strong support–and thirst–of the local population. 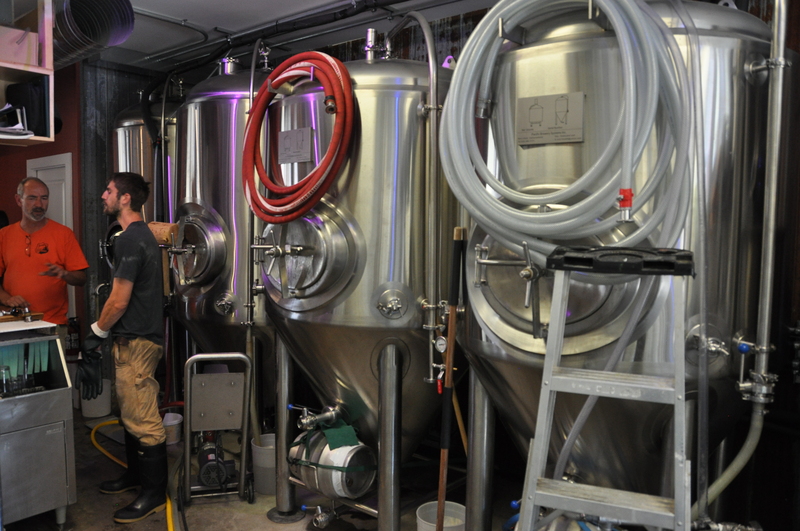 At a glance, the brewery seems to be brewing close to capacity, and it will be interesting to see if this results in a further expansion–perhaps a larger brewhouse or more fermenters. 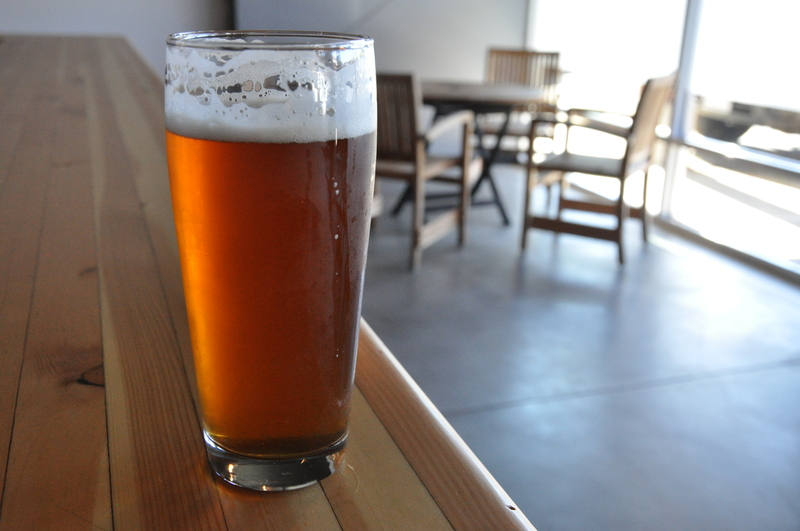 Well-made local beer, made in tune with local sensibilities. Now that was a well-thought-out business plan!